We’re back this week to a slightly unusual mineral to examine in thin section: halite. In my copy of Tröger (there is an English translation, but its also out of print), halite (NaCl) is listed as mineral number 4. Right up there with ice, lime (CaO), villiaumite (NaF), and sylvite (KCl). Minerals 1 – 64 in Tröger are isotropic, which means that we’re only going to have to worry about properties in PPL this week. In PPL, halite can vary from colorless, to a light blue-violet or yellow color. Inclusions of fluid or air within halite are quite common, which can make the crystals appear “dirty” in thin section. The refractive index of halite is 1.544, which is very, very close to the mounting epoxy, so halite will have a low relief and will make cleavage very difficult to see (even though halite has three perfect planes at 90). Ok, so who is looking at halite in thin section? Halite can form as a cement in sedimentary rocks and also as the primary component in some evaporite deposits. 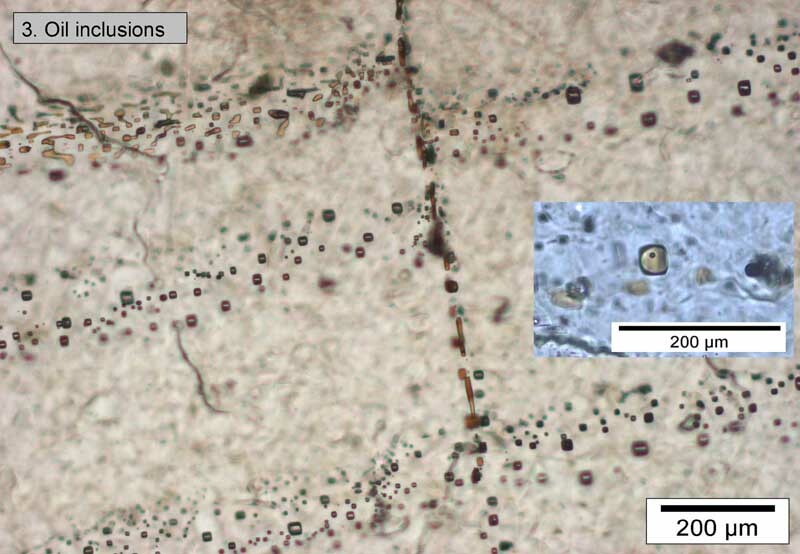 In the case of the group in Aachen (where most of the images above came from), the geologists are trying to discover how the halite has deformed over time to because it has implications for oil-bearing rock evolution. In the image below, droplets of oil has been incorporated as fluid inclusions in the halite. Before we come to an end, we should quickly discuss what halite might be mistaken for. 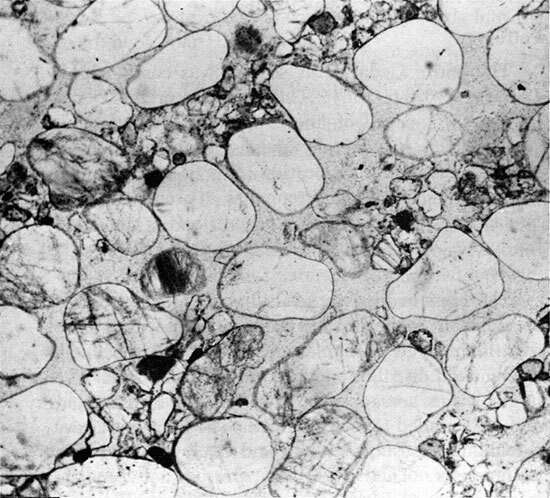 Next week we’re going to talk about plagioclase, which means that the Michel-Levy technique will come up.